Handwritten on the back, "A's celebrate World Series sweep becoming World Champs beating the S.F. Giants at Candlestick Park." Photo shows some of the Oakland A's players standing on the field hugging and hanging on each other and jumping up and down. Javier is jumping up in the air to land on his teammates. 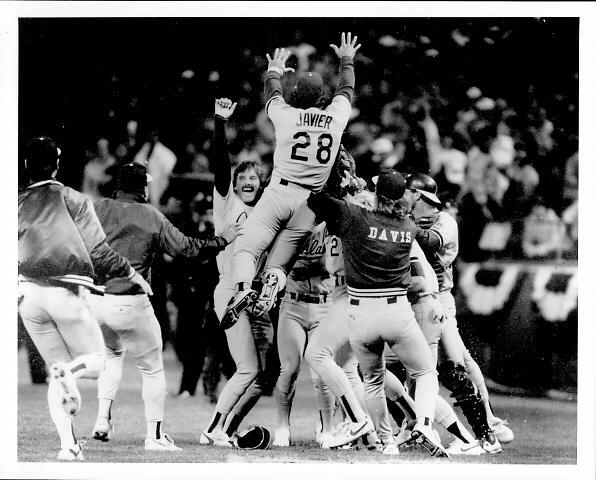 Dennis Eckersley is on the left side of the group, yelling and raising his fist up in the air in victory. Other players are running on to the field to join their teammates.